I got a contract for 26 shipping skids to carry Launching Engine Cylinder Covers for the USS Enterprise (CVN 65)) as part of her decommissioning. Each Cylinder Cover assembly is 12 feet long, 15 inches wide, 5 inches tall and weighs about 900 pounds. The skids are designed to carry 2 covers nested between 4×6 runners. The runners and stringers are assembled with 1/2 by 10 inch galvanized hex bolts with the heads countersunk into the bottom of the stringers. Average assembly time was 30 minutes including moving material, cutting, drilling, and assembly. From the profits on this I get a MIG welder and a cutting torch setup….MORE TOYS!!! More details in the blog section. Sounds like you got a result there mate, being an ex Navy man has served you well in winning that contract. HI ad a look at some of your pictures from your blog section, not impressed with the finger shot…... Ouch! Jobs are good. Paying jobs better. Keep it up. Well done. Doing woodwork for the Navy, couldn’t be better. I seem to remember replenishing food supplies to the Enterprise at sea 54 years ago.It’s sad to hear that she will be decommissioned. It sure looked huge seen from our little reefer, the USS Zelima. This photo shows what I’m talking about. I don’t know which carrier that is as I obtained this pic from the web only recently, but the center ship is the Zelima. Wonderful memories! Looks like some cold weather, wish it would warm-up around here! Well done Pete. Doing woodwork for the Navy, couldn’t be better. 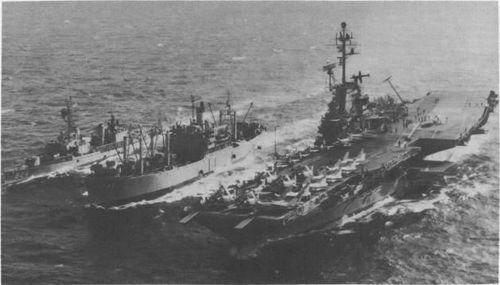 I seem to remember replenishing food supplies to the Enterprise (or maybe the Forrestal) at sea 54 years ago.It’s sad to hear that she will be decommissioned. those carriers sure looked huge seen from our little reefer, the USS Zelima. Worse yet, one of them put a hole in our side, not keeping on station. This photo shows what I’m talking about. I don’t know which carrier that is as I obtained this pic from the web only recently, but the center ship is the Zelima on which I served for almost 4 years. Wonderful memories! My apologies for the double post. I wanted to add some info and ran out of time, so wound up with two. Nice to get a job like this doing something you love to do. And getting new toys. Makes me a bit sad though as I sailed on the Big E in 1978 with RVAH-1 Smokin Tigers squadron. Showing my age. Thanks for the comments and pics….. The covers are 900 each…but they will be loaded later. I don’t have access to a forklift at the location, so I have to get the folks there to move anything with a forklift for me. I hate to do that as a matter of production, so I moved the lumber to the cutting and drilling area, cut it, drill it, and then move it to the assembly area. We started on the ground and then build them on top of each other. The boss….er…wife took a bunch of pics and video of the last one going together….I just haven’t had a chance to upload them to the blog yet….workin’ it. Congrats to you… I was on the Big E from 1985-89 What a great ship….. Nice work. wow….those are huge—-will you post pictures when the engine cylinder covers are on the skids? It would be cool to see! Awesome! Now why can’t I find pallets/skids like that to build my projects?! lol…. Getting paid is always nice. thanks all for the comments so far….good to be working….but I’ll admit, working in 30 mph wind at 38 degrees was interesting. I put hothands inside my gloves, right in the palms…worked well, and added some shock protection too. emart, was actually thinking about the 140 myself.